So it turns out my grogginess yesterday wasn’t only caused by an excess of wine on my birthday, but it was in fact caused by me being ill. I’m sure the wine didn’t help, but unless this is a two day hangover that causes a cold and a chesty cough, I’m definitely just ill. Fortunately I have a very lovely fiancé to take care of me (he’s literally making me noodle soup as I write this! ), so I shall be spending the day on the sofa, probably watching a continuous stream of rom-coms. I’ve already brought my duvet downstairs, which immediately makes me feel a little better. Luckily, my illness has not dampened my excitement about this recipe. Although I can’t really eat these right now (I’m sure you don’t want me to go into too much detail about my symptoms, but needless to say, eating a load of dairy is probably not what I need right now), I’m very much looking forward to returning to chocolate bliss once I’m better. 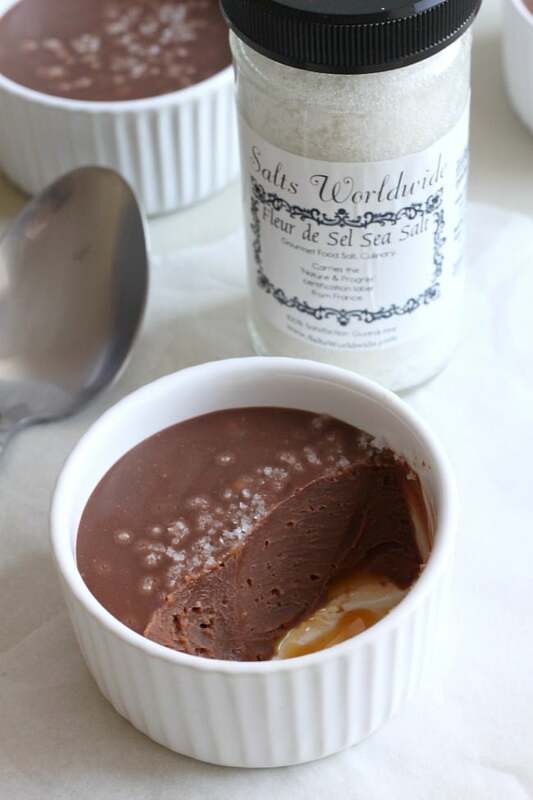 These salted chocolate pots are the little treats I made myself to celebrate my birthday. I hunted all over the internet to get inspiration for the recipe, but every single version I found contained egg – and although I’m sure those recipes work just fine, I couldn’t be bothered to faff around scrambling eggs, throwing the whole lot in the bin, scrambling them once again, and finally getting it right on the tenth try. So instead, I improvised, and made my own, egg-free chocolate pots. And let me tell you – they definitely don’t need egg. My simple recipe of butter, chocolate and cream (yep, all three of those…) worked just perfectly. 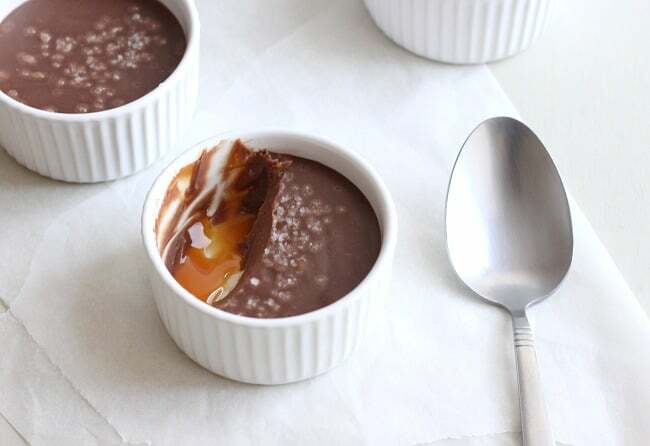 You could just make plain old chocolate pots, which would be awesome, but the things that really make this recipe spectacular are the gooey caramel sauce underneath, and the pinch of fleur de sel on top (that’s sea salt to us common folk). It might seem odd to add salt to chocolate, but it’s all the rage these days, and I can see why – every time a grain of salt lands on your tongue, it gives a little tang that offsets the super sweet chocolate just perfectly. It’s a really amazing combination! Make sure you dig right through the layers to get a bit of everything. I used this fleur de sel (no, spellcheck, I do not mean flour de del. Please stop correcting me) from Salts Worldwide, who have an amazing range of exotic salts, including sea salt, Himalayan salt, red salt, and black salt. They’re all natural and are rich in minerals. I definitely need to experiment more with ingredients like this rather than sticking with the same old ingredients I always use (chickpeas, spinach and mushrooms, anyone?). So feel free to throw some recipe suggestions at me! Have you ever tried salted chocolate or salted caramel? What did you think? Make sure you go and check out Salts Worldwide and their amazing range of exotic salts here. Melt the butter and chocolate together in a pan over a very low heat, stirring continuously. Add the cream, and continue to stir until smooth and fully incorporated. Pour around a tablespoon of caramel sauce into the bottom of six small ramekins, and swirl it around a little to coat the bottom. 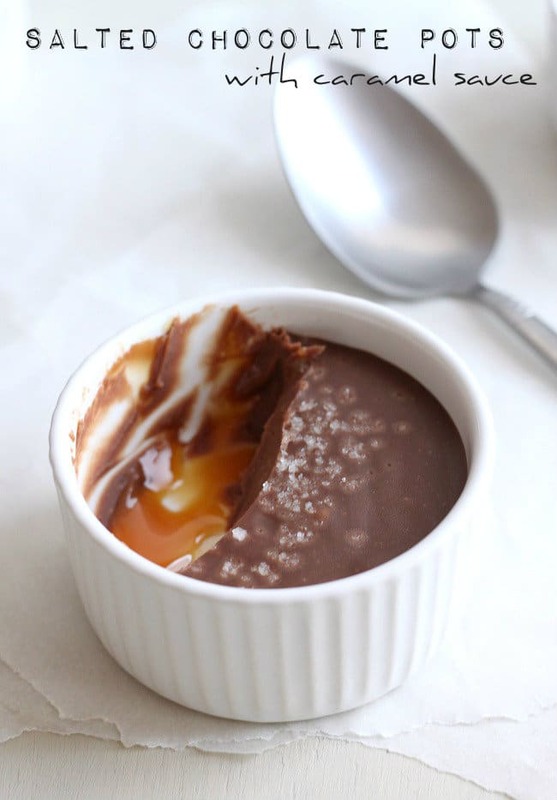 Distribute the chocolate mixture evenly between the ramekins on top of the caramel sauce. Place the ramekins in the fridge for around half an hour, before adding a pinch of fleur de sel to the top of each. Return to the fridge for another couple of hours, until fully set. 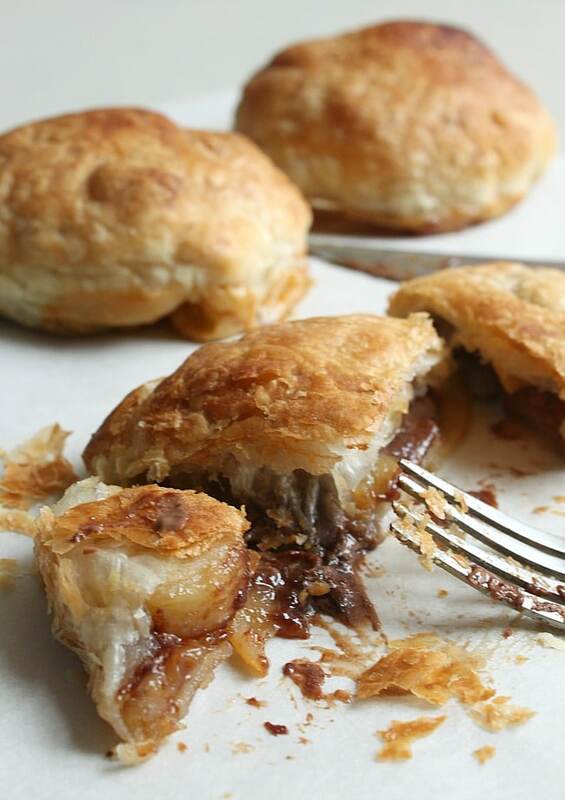 For another easy, chocolatey dessert, try my chocolate banoffee puffs! How long have you left them? They can sometimes take nearly a day to set. Otherwise perhaps some of the ingredients were measured incorrectly? Hope all the pregnancy icks have settled down now! Remember I said I’d made a vegan version of this recipe? I’ve just blogged it, and linked back to you. Thanks so much for the inspiration (but not the extra inches around my waistline!)! We loved salted caramel and have used it in lots of recipes, but salted chocolate something we must try. Making this soon! Thanks! Thank you for a beautiful simple, well written, easy to follow recipe. I got perfect results! These have been my go-to recipe for when I (or the missus) need a sweet hit. I mix it up sometimes and sub 100g of the milk for 85% dark chocolate to get that bitter edge that goes amazing with the salted caramel sauce I make. Anyway they both went down really well and were so simple to make! Hi Becca made these yesterday, gorgeous. Hadn’t got exactly the same ingredients so compromised. I used salted butter, Carnation condensed caramel milk [canned], a mix of 85%, 75% dark and normal cheap milk chocolate plus greek style yoghort and ordinary sea salt. As my ramakins seemed quite large I only got four out of the ingredients [I do have smaller ones so next time I will use those]. But they were so rich we felt chocolated out :-]. By reading the calorie count on the back of the packages I estimate that the total number of calories is 2667.5 so divided by six = 444.54 approx per pot. Though in our case it was 666.875 so not good to eat too many in one go. Incidently Lidl are doing a Turkish style yoghort made in Germany 1kg for £1.29 which is so thick it looked like a tub of ice cream when opened and dozen’t seem to produce much whey once used. Haha yes they’re not exactly diet food ;) but delicious nonetheless! The Turkish yogurt sounds great, I’ll keep an eye out for that! Ps my ramakins are 4″x 2″ deep and they are about 2/3 full of chocolate mixture to die for. I’d hate to be a party pooper, but I have to ask… How many calories per portion? I know, I know, screw calories when you’re treating yourself to a dessert this lovely, but I’d love to know if whipping up a couple of these would ruin my clean eating track record. Haha I actually don’t know, but if you plug the ingredients into a tool like Myfitnesspal (https://www.myfitnesspal.com) it should let you know! I came across your Salted Chocolate Carmel recipe today and would like to try it. I’m a cooking novice and so need to ask what is “double cream”? Hi Staci, a couple of people have asked about double cream further up in the comments, if you’d like to take a look? Basically double cream is just the cream we have in the UK that has a slightly higher fat content – it’s still pourable, but isn’t lower in fat like our single cream is. I think heavy cream might be the closest equivalent? Can i ask, did you use salted or unsalted butter in this recipe? I’d say mine were probably about 3 inches in diameter. I’m a bit late to this chocolate party but better late than never. I made these with dark chocolate and some home made toffee sauce, they were fantastic. My toffee sauce was quite firm( solid actually) so when it came time to eat them I sat theots in a baking tray with some boiling water for 5 mins. the caramel became soft and gooey and oh so good. So in the chocolate salt pots you mention cream. What type did you use? Like a heavy Whip cream? Thanks! Hi Diona, as it says in the recipe I used double cream. I think double cream might be the equivalent of US heavy cream? It doesn’t need to be whipped. These sound heavenly Becca. I may use milk and dark good quality choc and maybe a bit of brandy? Can’t wait to try them now, thanks for the recipe. Hope you feel better soon, I think I have that virus too! Thanks Becca. I used some sea salt and it worked out great – just need to be careful not to use too much and it was a hit! Can you substitute kosher or sea salt ? Super duper yum. I love your blog, btw. I was shocked you were a SITStah! You hit a homerun with these. 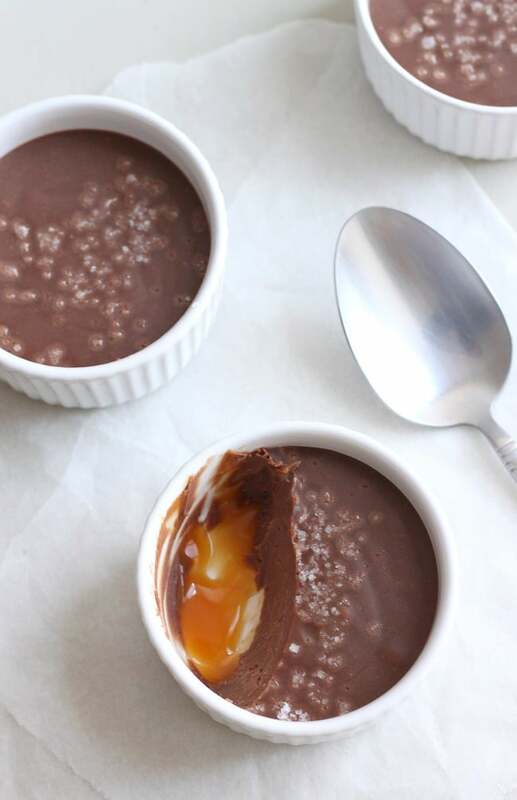 The combination of caramel, chocolate and salt is one of my alltime favorites but I do not have a fab recipe for Salted Chocolate Pots with Caramel Sauce. I hope you are feeling better. You have a wedding coming up! These look insanely good! I can’t wait to try this recipe. These look divine! I’m pinning in the hopes that I’ll get myself together and find time to get in the kitchen and make these! do you think heavy cream would be an acceptable substitution for double cream? I live in the US and am not sure where I could purchase double cream… Thanks in advance! Ohhhhhhhh these look so heavenly. These are so being made. Like today. ! omg this looks so incredible and indulgent! Do you know how your ingredients would transfer over in metrics (cups, tablespoons, teaspoons, etc?) This recipe looks awesome and I’m dying to try it, but I’m unsure with the measurements. I’ll do my best to estimate for you – I don’t think it will matter if you’re not entirely accurate. I’d say I probably started with around 4tbsp butter, then I added 1 1/2 bars of chocolate (a bar being something like 6 inches x 4 inches), and then around a cup of cream. Hope that helps a bit, sorry if it’s not accurate enough for it to work properly but I think it should be ok! Thank you for your help! I think I’ll make them this weekend as a special treat! You hit my sweet tooth big time! These look amazing…I love sweet-salty desserts! oh emmm geee!!! This sounds absolutely amazing, Becca! my goodness…………….. YUM this is my kind of dessert. Making these tonight, love the idea of sweet and salty desserts. Hope you are beginning to feel a bit better, Becca. Not nice at all, and yes, dairy is the last thing you want now! These look delicious – I have had salted caramel and it is gorgeous, as you say the contrast between the tiny salt hit and the overall sweetness is just magical. Your chocolate pots are just like ganache, aren’t they, but probably a looser mixture and sweeter without the very dark chocolate usually used (and all the nicer for it I bet). One to try when I am NOT trying to reduce my sugar intake! Yeah I don’t really like dark chocolate, so I decided to go for milk chocolate and it worked just fine :) make sure you try these when you’re back on the sugar!! Is double cream the same as heavy cream? I’m not 100% sure what heavy cream is, but as far as I know, it’s the American equivalent of double cream. Double cream is just cream with a slightly higher fat content (than our ‘single cream’) – it’s still liquid though. I think it’s the same? such a decadent dessert! yum! These look delicious! I was thinking about making brownies with caramel this weekend but I think I’ll try these instead. Hope you feel better. Yumm…these look so delicious!! Definitely pinning to try soon. I’ve had salted caramels, which I really enjoy, but never salted chocolate.